Amazon has announced its 70 per cent royalty offer for UK authors and publishers for its Kindle platform, allowing budding authors and publishers to get their books onto the ebook market and take a cut of the profits. The Digital Text Platform (DTP) allows authors to upload their books and make money from the books sold to Kindle and other ebook device owners that can use Amazon's system. The new royalty system gives authors and publishers five per cent more royalty than the previous DTP deal, bringing it into line with the 70/30 split that Apple applies to the sale of its apps through the iPhone, but does ask for more in return. "The 70 per cent royalty option for Kindle Digital Text Platform has been available for a few months for sales to US customers," said Greg Greeley, Amazon Vice President, European Retail. "We are excited to be able to announce the launch of the 70 per cent royalty option in the UK. Now authors and publishers worldwide can offer more content to Kindle customers in the UK and make more money from the books they sell." Books receiving the 70 per cent royalty option will have access to the same features (and be under the same rules) as books on the standard DTP royalty rate. However, there are requirements that must be met by those wanting a slightly larger slice of the pie. The author or publisher-supplied list price must be between £1.49 and £6.99. The list price must be at least 20 per cent below the lowest list price for the physical book. The title is made available for sale in all geographies for which the author or publisher has rights. 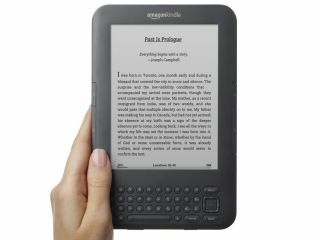 The title will be included in a broad set of features in the Kindle Store, such as text-to-speech. This list of features will grow over time as Amazon continues to add more functionality to Kindle and the Amazon.co.uk Kindle Store. "Delivery costs are based on file size, and pricing is set at £0.10/MB," explains Amazon. "At today's median DTP file size of 368KB, delivery costs would be less than £0.04 per unit sold. "For example, on a £5.99 (VAT exclusive) book an author would make £2.10 with the standard option and £4.17 with the new 70 per cent option. "This new option will be in addition to and will not replace the existing DTP standard royalty option."